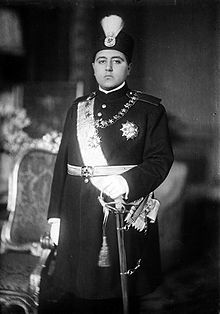 Ahmad Shah Qajar (Persian: احمد شاه قاجار‎; 21 January 1898 – 21 February 1930), was Shah (King) of Persia from 16 July 1909 to 15 December 1925, and the last ruling member of the Qajar dynasty. On 16 July 1909, Mohammad Ali Shah was overthrown by rebels seeking to restore the 1906 Constitution. The rebels then convened the Grand Majles of 500 delegates from different backgrounds, which placed Ahmad Shah, Mohammad Ali's six-year-old son, on the Sun Throne. The Grand Majlis enacted many reforms. They abolished class representation and created five new seats in the Majlis for minorities: two seats for Armenians, and one seat each for Jews, Zoroastrians, and Assyrians. The Majles also democratized the electoral system, diminished the electoral dominance of Tehran, and even lowered the voting age from twenty-five to twenty. Not much is known about Ahmad's early life before his succession to the throne. Due to his young age, his uncle, Ali Reza Khan Azod al-Molk, governed as regent. Ahmad Shah was formally crowned on 21 July 1914, upon reaching his majority. He attempted to fix the damage done by his father by appointing the best ministers he could find. He was, however, an ineffective ruler who was faced with internal unrest and foreign intrusions, particularly by the British Empire and Russian Empire. Russian and British troops fought against the Ottoman Empire forces in Persia during World War I. The Second Majlis convened on November 1910 and just like the First Majlis, did not lead to any relevant accomplishment. The Majlis was rendered ineffective because the central government was weak and did not have enough influence to rein in the changes that it had proposed. 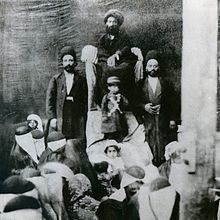 Ahmad Shah (center) as a child, pictured with Haj Seyed Gholamhossein Majd Mojabi (above) and guards in 1901. In 1917, Britain used Persia as the springboard for an attack into Russia in an unsuccessful attempt to reverse the Russian Revolution of 1917. The newly born Soviet Union responded by annexing portions of northern Persia as buffer states much like its Tsarist predecessor. Marching on Tehran, the Soviets extracted ever more humiliating concessions from the Persian government – whose ministers Ahmad Shah was often unable to control. The weakness of the government in the face of such aggression by an atheist foreign power sparked seething anger among many traditional Persians – including the young Ruhollah Khomeini, who would later condemn both Communism and monarchy as treason against Persia's sovereignty and the laws of Islam. By 1920, the government had virtually lost all power outside the capital and Ahmad Shah had lost control of the situation. The Anglo-Persian Agreement, along with new political parties, further immobilized the country. The Moderates and Democrats often clashed, particularly when it came to minority rights and secularism. The debates between the two political parties led to violence and even assassinations. The weak economic state of Persia put Ahmad Shah and his government at the mercy of foreign influence; they had to obtain loans from the Imperial Bank of Persia. [clarification needed] Furthermore, under the Anglo-Persian Agreement, Persia received only a small fraction of the income generated by the Anglo-Persian Oil Company. On the other hand, the Red Army along with rebels and warlords ruled much of the countryside. 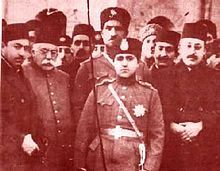 On 21 February 1921, Ahmad Shah was pushed aside in a military coup by Colonel Reza Khan, Minister of War and commander of the Persian Cossack Brigade, who subsequently seized the post of Prime Minister. During the coup, Reza Khan used three thousand men and only eighteen machine guns, a very bloodless coup that moved forward quickly. Reza Khan was a self-made man who climbed his way up through the military ranks and appeared to be the right man to take back control of Persia. One of his first actions was to rescind the Anglo-Persian Agreement, and this was seen as a very successful diplomatic move since the treaty was very unpopular. In addition, he signed the Russo-Persian Treaty of Friendship. This agreement canceled all previous treaties between the two countries and also gave Persia full and equal shipping rights in the Caspian Sea. Ahmad Shahi Pavilion was built at the end of the Qajar era as Ahmad Shah's dwelling among Niavaran garden. Stripped of all his remaining powers, Ahmad Shah went into exile with his family in 1923. Ahmad Shah's apparent lack of interest in attending to the affairs of the state and poor health had prompted him to leave Persia on this extended "European Tour". He was formally deposed on 31 October 1925, when Reza Khan was proclaimed Shah by the Majlis, as Reza Shah Pahlavi. This terminated the Qajar Dynasty and established the Pahlavi Dynasty. 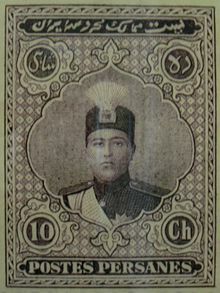 Ahmad Shah Qajar on stamp 10 shahis. Reza Khan (later Reza Shah Pahlavi) behind Ahmad Shah with the prominent prince Abdol-Hossein Farmanfarma. The coup of 1921 rendered Ahmad Shah politically weaker and less relevant. In 1923, Ahmad Shah left Persia for Europe for health reasons. Later, the formal termination of the Qajar Dynasty by the Majles, turned Ahmad Shah's 1923 European tour into exile. Prior to his death, it is said that Ahmad Shah followed frequent crash diets which did not help his health. For example, he lost and gained 90 kg within a two-year span. He died in 1930 at Neuilly-sur-Seine, outside Paris, France, and was buried in his family crypt in Kerbela, Iraq. 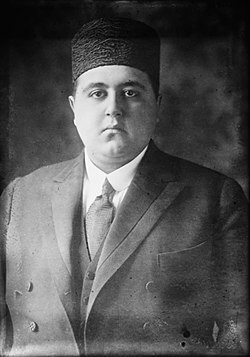 His brother, former crown prince Mohammad Hassan Mirza, assured the continuation of the dynasty through his descendants. Ahmad Shah Qajar married five times. His first wife was Lida Jahanbani. He had four children, each by a different wife. He had 12 grandchildren, who respectively carry the last names Albertini, Faroughy, Panahi and Qajar (also spelled Kadjar). ^ "16-year-old Shah of Persia Sworn In", The New York Times, 22 July 1914. ^ "Portraits and Pictures of Soltan Ahmad Shah Qajar (Kadjar)". qajarpages.org. Retrieved 21 January 2014. ^ "Children of Soltan Ahmad Shah Qajar (Kadjar)". Qajarpages.org. Retrieved 21 January 2014. Nosrati Ahmad, A Letter to Intellectuals: The Manipulation of the Persian Nation by Western Power and Russian Policy, Trafford Publishing, 2004. Abrahamian Ervand, “Oriental Despotism:The Case of Qajar Iran” International Journal of Middle East Studies, Vol. 5, No. 1 (Jan. 1974). Ammanat Abbas, “Russian Intrusion into the Guarded Domain": Reflections of a Qajar Statesman on European Expansion” Journal of the American Oriental Society, Vol. 113, No. 1 (Jan. – Mar. 1993), pp. 35–56. Wikimedia Commons has media related to Ahmad Shah Qajar. A slide show of some photographs from a collection belonging to Mohammad-Hasan Mirzā, by Shahāb Mirzāi, Jadid Online, 2008 (2 min).